One of the things I did to help me plan a Mommy and Me trip to Sydney was check Instagram. If you look up #SYDNEY you might see something that catches your eye. 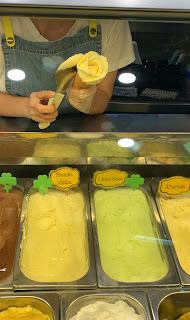 The one that caught mine was gelato in the shape of a rose from @icreamygelato and I was super happy to find we were staying nearby. The little shop is located in Sydney CBD and all their gelato is made in-house from scratch daily. They serve 24 gelato flavors, but only certain ones can be used to make the flower gelato. 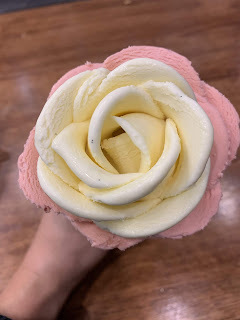 You can choose 2 or 3 flavors for the flower. We went with vanilla and strawberry. The flower was very pretty and the gelato was absolutely delicious. Be sure to bring cash as they are cash only.